We seek your support to meet the expenses relating to the formatting of articles and books, maintaining and running the journal through hosting, correrspondences, etc.Please write to the Editor in his e-mail address languageinindiaUSA@gmail.com to find out how you can support this journal. Thank you. Thirumalai, Editor. Editor: J. Sundar Singh, Ph.D.
Jordanian students in the secondary schools face difficulties while writing English language. These problems arise because the students are not adequately familiar with English language and they do not have enough practice of it. This article highlights the main reasons behind the problems of writing and recommends some solutions to overcome them in the Jordanian classrooms. The skill of writing is one of the four skills of English language which must be taken into consideration and not neglected. Writing in a foreign or second language is a courageous experience especially for students whose native language is not of the same origin as the target language. 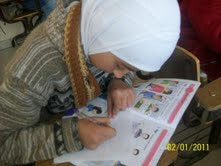 Arabic-speaking students learning English is a good example here. These students are faced with the school curriculum that includes the four main skills of English language. Among these skills, they find writing skill the most difficult one and face many problems while composing simple short paragraphs. Writing in general is the least lovable skill to Arabic-speaking students and this can be contributed to the fact that successful learning of the writing skill depends on the success learners have with the learning of other skills. Normal teaching programs adopt the natural order of listening, speaking, reading and writing in their teaching schedule. Even though writing comes as the last skill, it can't be neglected and needs a lot of attention from the teacher and the student because it is necessary in daily academic life. Students are expected to learn how to be good writers. If they can't write correctly and logically using appropriate language and style, life will be difficult for them not only at school but in adult life, too (Neville, 1988). The objective of this study is to show that the roles of the teachers and the students go side by side when it comes to mastering writing problems which many high school students face in the public schools in Jordan. The problems they face could be as a result of the lack of knowledge in English language such as not being able build up adequate vocabulary. It is also due to the reason that the students do not know how to write words, phrases, and sentences. They may also not be good at all in all the skills of the language. They may face a lot of native language interference or they may lack motivation. Writing gives the opportunity to the students to be adventurous with the language, to take the risk and to go further of what is learned to talk about (Shouman, 2002, p.1). The teachers of English language who teach in high schools are aware of the difficulties involved in the process of learning how to master the different types of writing tasks and how to produce fairly coherent, accurate, meaningful and proper composition by high school students.